News that the grave of the great Spanish poet Federico Garcia Lorca is soon to be exhumed is causing considerable controversy. Lorca never considered himself a political poet but rather a man of the people. His works focused on human suffering and injustices. 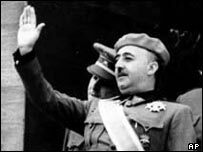 But in the lead-up to the civil war in the 1930s, this was enough to make him hated by Spain's right-wing nationalists. 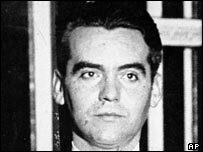 Like thousands of others during the conflict, Lorca was shot in August 1936 and buried in a mass grave. In many ways he symbolises the country's painful 20th-century history, and its modern-day struggle to come to terms with the past. More than a quarter of a century after democracy came to Spain, more than 30,000 victims of the civil war and the repression that followed still lie in mass graves, scattered across the country. Spaniards call them the graves of forgetting. Efforts by families to reclaim their loved-ones' remains have been hindered by a lack of official interest and funding. But pressure to open the grave shared by Lorca means the issue is coming under renewed - and for many unwelcome public scrutiny. It comes as no surprise that the man credited with finding Lorca's grave is no Spaniard. Ian Gibson, an Irishman and Lorca expert, started looking in 1965. "Of course then Spaniards were living in a dictatorship and were not free at all to speak of assassinations and mass graves," he says. "But even now people say it's better to forget. But how can Spain forget if it's never officially remembered. Scars can't heal until you admit they are there." Certainly other campaigners like Emilio Silva believes the past should not be forgotten. Three years ago he founded the Spanish Association for the Recovery of Historical Memory and began the process of opening the country's mass graves. He asked to meet me in Madrid's largest graveyard. "You see this," he said, pointing at the grand-looking graves all around. "30,000 Spanish families have no graveside to which they can bring flowers. Their loved-ones lie dumped with other unfortunates in mass graves." In fact, so much attention is being paid to Lorca that many other families feel resentful, he says. "They don't see why, just because he was a poet and playwright, he should get special treatment," he said. But there are those who argue that it is for the good of Spain that the past remains buried along with its victims. In 1975 the country's politicians decided to draw a line under the civil war and 40 years of fascism. There was no looking back. It is known here as the Pact of Silence. Even decades later, many are reluctant to break it. One of them is pro-government MP Manuel Atencia. "Of course the government recognises the rights of families to privately re-bury their dead, but we see no point in re-opening old wounds that afflicted Spanish society. These matters are for historians, not politicians," he told me. A considerable number of Spaniards agree. Even Lorca's relatives are against disturbing their uncle's grave - though they are being shouted down by the families of the men who share the grave and by the poet's fans. Laura Garcia Lorca de Los Rios runs the Lorca museum in Granada, where the poet and his family lived for many years. "We feel the mass graves are a kind of cemetery as they are," he said. "My uncle lies in good and noble company and the little information to be gleaned from digging up the graves doesn't justify what is essentially an extremely violent act." But blocking out the past does not stop the pain. Up to 3,000 people are buried in a mass grave in Viznar, a village just outside Granada, close to where Lorca is thought to lie. Like the other mass graves across Spain, there is little to indicate that such a tragedy is buried here in a hilly woodland. Only a clump of stones and a handful of artificial flowers mark the spot. Paco Gonzalez Arroyo, a local historian who brought me there is visibly moved. "Anyone who comes to this place feels the sadness and pain," he said. "The flowers and the stones bear witness to it - laid by the families of the dead, fed-up that their loved ones are abandoned here anonymously." But the process is only just beginning. In the meantime Lorca's fame gives a face and a name to Spain's dead thrown in ditches.